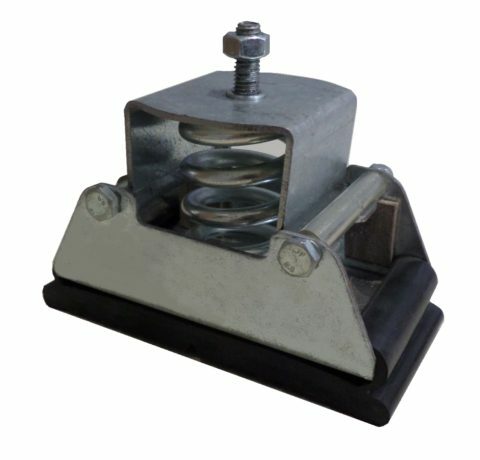 Vibro - ΑMR .wm is an anti-vibration spring mount, with multi directional restraint, with relative limit stops and internal stainless steel wire mesh cushion. Vibro – ΑMR .wm is an anti-vibration spring mount, with multi directional restraint, with relative limit stops and internal stainless steel wire mesh cushion. 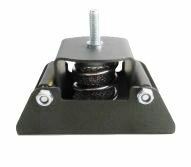 It is the closed type wire mesh vibration damper for relatively low weights that offer restrained spring mount protection with wire mesh technology. The metal plate are protected from oxidation with polyester powder paint. On the bottom it can be fixed with the use of M8 pass -through bolts. On the upper part is an M8 bolt in order to be fixed to the machinery. Within the inside diameter of the coil spring there is a resilient cushion knitted stainless steel wire mesh which increases the damping factor and limits the amplification at the natural frequency. Vibro-AMR.wm can be used for low frequency vibration control (low speed rotation 400 rpm upwards) that also require lateral and vertical restrain and protection from earthquakes and excess wind pressure, such as air compressors, two-cycle engines, chillers, water coolers, air handling units. It can be used for vibration isolation of mechanical equipment in military marine and avionics applications. Vibro-AMR.wm performs well in tough environments, and it is also resistant in normal liquids and dust. – Vibrating equipment subjected to seismic events. – Vibrating equipment with significant center of mass alternations. – High wind loads or other external forces are applied. 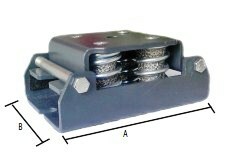 Vibro-AM.wm is a free standing single spring anti-vibration mount, with internal knitted stainless steel wire mesh. This metal cushion inside the spring increases the damping factor and limits the vibration at the natural frequency. I would like more information regarding this product. Select your region in order to get in touch with the nearest VIBRO Representative.